As far as advertising is concerned, the Arksen 3000 corded-electric pressure washer is called the perfect equipment. The manufacturer claims it can pressure wash pretty much anything from general structures to vehicles, with many others in between. Of course, we couldn’t just take all those promises for granted and looked it up. Below, you’ll get to read our most important findings on the Arksen 3000. 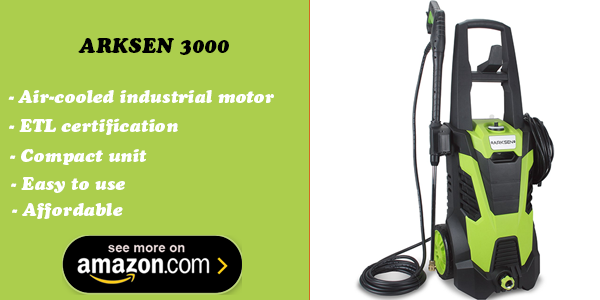 Arksen 3000 electric pressure washer is easy to use, very well built and has decent power. Maximum pressure at the burst of 3000 PSI. This particular corded-electric pressure washer was named Arksen 3000 because it’s supposed to reach a 3000 PSI. But carefully going through the user manual, it became obvious that the 3000 PSI is actually the maximum pressure, at burst. The working rated pressure, as stated above, is of 2200 PSI, which promises moderate strength. In other words, this isn’t the type of professional pressure washer with a PSI of at least 3000, used in commercial settings. The misleading name left aside, we still have to look at the water flow. A safety lock switch designed to shut off the pump for as long as the trigger is not engaged. The last feature, in particular, should make the Arksen 3000 save more energy while operating. At the same time, it should also contribute to prolonging the life of the pump. Despite being a corded unit, this pressure washer isn’t particularly small, nor lightweight. The washer itself measures 34.5 x 17.5 x 14.5 inches and weighs 31 pounds. The package content will include, aside from it, a spray wand and the interchangeable nozzle adapter, the hose and the instructions manual. Now, even though bulkier than, let’s say, a GreenWorks corded-electric pressure washer, the Arksen 3000 isn’t necessarily more intimidating. The black one, the soap nozzle works with the lowest pressure, for applying detergent on surfaces before switching to a more suitable pressure. Pulling the tab from the base of the spray gun, to secure the hose. In a nutshell, it shouldn’t be too complicated to put it together. The compact and ergonomic design will afterward come in handy. While the large handle and the large wheels will let you push it with ease. Even the convenient built-in storage options, for the accessories, will help along the way. This is probably the part where the great picture provided by the manufacturer doesn’t exactly match the reality… As it turns out, there are all-positive reviews and negative reviews about the Arksen 3000 corded-electric pressure washer. Some people just seem to be lucky and swear that it works as expected, meaning great. Whereas others don’t get to enjoy it as much as they would. After all, it’s still a relatively cheap product and malfunctions are expected on the road… So, aside from the attractive price and the design, some customers are concerned with the overall quality. Reports indicated a burning smell that was associated with a typical smell of plastic equipment. And there were voices mentioning the plastic connections that can feel a bit flimsy. The last observation certainly requires special attention when putting the components together. Now that we’ve seen what customers have to say, a recap might bring up some light on the Arksen 3000. Affordable price for this range of corded-electric pressure washer. All its connections are made of plastic, therefore threading the components must be done very carefully. “If Ken or I ever tell you we will finish your job by a specific day, and we miss, we’ll make it right by you. Period. Come hell or high water, we get jobs back to you when we promise, because we know how important those dies are to your business. You have my word on it.“, signed by Don Dostie, President of Arken Manufacturing. If you’re not planning on using it intensively, you like the price, and… you don’t mind adding a protection plan to it, from the seller you will be choosing… This Arksen 3000 might be worth the investment. Just keep in mind, though, that it’s a cheap product and some quality flaws might interfere!